The Massachusetts Institute of Technology team behind the work says the bandage has the potential to become a staple of the operating theatre. It is biodegradable and dissolves over time, so there is no need for it to be removed. And the rate of degradation, along with the micro-structure and elasticity of the bandage can be fine tuned, potentially enabling it to be used for many different medical applications. According to the researchers these include patching a hole caused by an ulcer, and resealing the intestine after removal of a disease segment. Because it can be folded and unfolded, the bandage also has potential for use in minimally invasive procedures difficult to stitch because they are performed through a very small incision. The bandage is made out of a biorubber invented by the MIT team, which was shaped into the same tiny hill and valley structures found on geckos' feet. Various combinations were tested on pig tissue, and the stickiest one was found to be made up of pillars spaced just wide enough to grip and interlock with the underlying tissue. The researchers then added a very thin layer of a sugar-based glue, to create a strong bond, even to a wet surface. 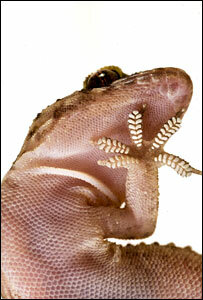 Researcher Dr Jeff Karp said: "We are inspired by the gecko to create a patterned interface to enhance the surface area of contact and thus the overall strength of adhesion." Tests on rats showed the new bandage formed strong bonds, and provoked only minor immune reaction that should not pose a significant problem in a clinical setting. Professor Kellar Autumn, an expert in the field from Lewis & Clark College, Oregon, said: "This is exciting because it shows that we can go beyond nature to engineer designs that never evolved, and suggests that gecko adhesives will have broad application in medicine in the future." However, he said the nanostructure developed by MIT was relatively primitive compared with that found on geckos' feet - and consequently was not as sticky. Researchers announced last year that they had combined the adhesive properties of geckos and mussels to create a new super-glue dubbed geckel, which they believe has potential medical applications. Geckel is made from a fibrous silicone coating, similar in structure to a gecko's foot, and a polymer which mimics the "glue" used by mussels.